Mac High Sierra has made it very hard for apps not sold through their app store or approved developers to run. Previously, Mac users had the option to allow apps they downloaded from the Internet to run. It was called "anywhere". The July 2018 High Sierra 10.13.6 prevented our guides from running on some Macs - but not others. If you want to use our guides on the latest versions of Mac you need to restore your option to run apps from anywhere. You should do this even before downloading the guides. 2. This is what the Security and Privacy window used to look like prior to version 10.12. There was an option to allow applications from Anywhere. On the older versions you would click on the Padlock, enter your password to make changes, then select Allow Applications from Anywhere. After MacOS High Sierra 10.12 the "Anywhere" option vanished and now, with High Sierra 10.13.6 or later our apps may not run unless you get back the option to run apps from anywhere. How to get back the allow apps from anywhere option. It's very quick and easy. 1. Make sure the system preferences window is closed. 2. Open the launch pad and look for an icon named "other" showing smaller icons inside. Open that and find the "terminal" icon. 4. Click return and enter your administrative password - you won't see anything being typed when you enter the password - then click return again. This will reset your computer to run apps from anywhere. That's it. 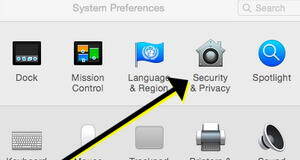 After you have installed and activated the guides you can go back to system preferences, security and privacy, click on the padlock to make changes and change the setting back to allow only applications from the apple store and approved developers. We recommend you get the DVD - same price as a download - unless you really can't wait 2 to 3 weeks or unless you are in one of the Pacific Islands where we can't mail the DVD to you. If you are in New Caledonia you can get the DVD or the Installation files from Noumea Ocean - at Port Sud Marina in Noumea but you will need to pay for a download online first. Call Chloe to arrange a meeting. Her phone number and a google map showing her location are on her website www.noumeaocean.com. If your computer does not have a DVD player you can use another computer that does have a DVD player to transfer the files from the DVD to a USB drive and then install the guides on your computer from the USB drive. Or, you can use Chloe's USB stick to transfer the installation files to your computer. If you have a very good Internet connection then go ahead and download the guides - but you can't download and activate the guide successfully unless you use freedownloadmanager to download the installation files. You must use freedownloadmanager to avoid problems with the download. If you use Safari or a download app you got from the Apple Store to download the file Apple "tags" the download and when you try to open the file, your Mac will notifiy you that the file is damaged and should be trashed - even when there is nothing at all wrong with it. Freedownloadmanager speeds up the download (often by 400%), assures the files are completely downloaded and can check their integrity. If there is a brief server-interrupt during the download (and there is a very good chance of this) the download manager will resume the download without a problem. You'll be glad to have the download manager next time you go to download something from the Internet. So, before you start downloading the installation files for the guides, go to Freedownloadmanager.org and download and install the Mac version of this excellent, free program. When you make your payment for the cruising guide you will immediately be transferred to a page with instructions for installing the guides, your username and password to log into the activation centre to activate the cruising guide and links for downloading. An email is also sent to you from ncvan.us with the same information and links, detailed download and installation instructions and your password and username to log in to the activation center. THE DOWNLOAD LINKS ARE ONLY VALID FOR 72 HRS. IF THE COMPUTER YOU USE TO DOWNLOAD THE FILE IS NOT THE ONE YOU PLAN TO USE WHEN ACTUALLY CRUISING, COPY THE FILES ONTO A USB KEY AND TRANSFER THEM TO THE COMPUTER YOU INTEND TO USE IT ON. THE GUIDE WILL ONLY BE ACTIVATED FOR ONE COMPUTER BUT YOU CAN PURCHASE A SECOND ACTIVATION FOR YOUR BACKUP COMPUTER. The companion travel guide does not need to be activated and you can use it on any computer you own. Open the email from ncvan.us with the installation instructions. If you did not get one after your purchase check your spam box or use the contact form and we will send it again. Open freedownloadmanager then click and drag the link onto the freedownloadmanager window and drop it there to start the download. After the download is finished, continue with the installation and activation instructions below. 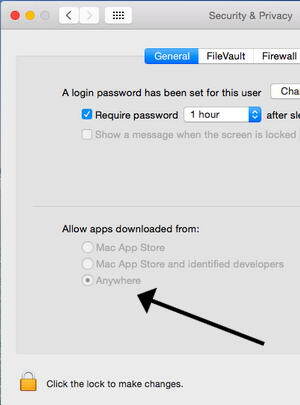 Did you give your Mac permission to allow apps from anywhere as shown above? Did you first download and install the free Freedownloadmanager and use it to download the file? If not, do that first and try again. Sometimes the download stops just before finishing. If it does, click on the pause icon. It changes into a play button. Click on that to resume and finish the download. Did you get an error code saying "access denied. Invalid user space name or password"? The download connection must have stopped for more than the allowed interval. Perhaps your computer went to sleep because nobody was using it. Check your power settings to be sure it is not going into standby mode when you are not using it. 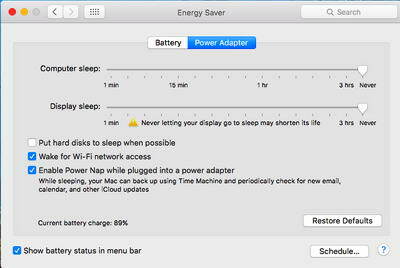 To do this, click on the apple icon and select System Preferences then click on the lightbulb icon that says "Energy Saver"
On the top of the Energy Saver settings window select Power Adapter and make sure the Computer Sleep and Display Sleep are both set to "Never" and uncheck the Wake for Wi-Fi and Enable Power Nap check boxes. You can reset these power settings to the default after you have downloaded the files. Click OK. and OK to close the options box. Begin the download process again, don't resume, restart. Keep an eye on the active download desktop indicator. If the speed drops to zero and stays there for any length of time make sure you are still connected to the internet and, if not, fix the internet connection problem as quickly as you can. If the download indicator does not automatically begin showing the download speed again, open the downloadmanager window and click on the pause button. Then, after that changes to a play icon, click the play icon to resume the download. 1. Double click on the installation file INSTALL-MAC-NEWCALEDONIA-CRUISING. 2. Put your cursor over the anchor and press down on the trackpad, slide your finger to the right while continuing to press down. This will move the anchor over the blue "Applications" folder. When the anchor is over the folder lift your finger off the trackpad. The application will then be copied into the applications folder. 1. Open your Internet Browser (Safari or Chrome) and check to be sure you are connected to the Internet. 2. Open the email from ncvan.us sent to you when you purchased this DVD to get the username and password to log into the activation site. 3. On the task bar (bottom of your desktop screen) click on the rocket ship to open the screen showing all your applications. You might have to swipe your fingers from right to left on the trackpad to move to the last screen where you will find the anchor icon for NEWCALCRUISING. 4. Double click on the anchor icon and a registration window will appear. Note: If you get a message there is something wrong with the file or the license at this point. Delete the cruising guide folder from Applications, empty the trash and do the installation again using the above steps. This usually fixes the problem. 5. Click on the "Get Code" button. This will open the activation page in your Internet Browser. You might have to move the registration window to one side to see the login fields. 6. Log in with the username and password from the email. 7. Click and drag over the license code to highlight it then two-finger-click on the highlighted code and select copy. 8. In the registration window click on the "Unlock" tab and two finger click on the license code form and select paste. Then add your username as shown on the activation site. The guide will work on that computer unless you change something drastic (like the hard drive). If the guide does not open after you install it properly, read the section below on Activation Problems for how to get it working. If you purchased the guide online you were sent an email from Rocket Guides with the activation information, including the username and password. If you did not get the email, use the contact form to send an email asking for another email. Be SURE to use the same email address you used when you purchased the guide. If you purchased the guide from a bookstore or agent they should have given you the username, password, and activation instructions. If they failed to do so, contact them and ask for the activation information. We can't help you because we don't know who buys the guides from a book store or agent. Be aware that the only authorized sales agents are: Boat Books Australia, Boat Books New Zealand, Noumea Ocean, Noumea Yacht Services and the Island Cruising Association. My cruising computer can't go online. This is complicated so if there is any way your crusing computer can go online do it that way. But if it really can't access the Internet you can get the activation key from another computer that can go online (eg from an Internet Cafe or tablet) . 1. Insert a USB drive into your cruising computer. Open a txt file with notepad. 2. Start the cruising guide program and when the registration window appears, highlight and copy the hardware code (it will look something like A106-6409-N) shown on the bottom border of the registration window. Paste this into the text file. 3. Type the website address ncvan.us/ncmac into the txt file. 5. Open the txt file on a computer that can go on the Internet. 5. Go to ncvan.us/nclogin, log in using your username and password. 7. Click on the link to activate the guide on a Mac from another computer. 8. Copy and paste the hardware code into the text box and click OK.
9. Copy the activation key and paste it into your text file then save it back to the USB drive. 10. Insert the USB key in your cruising computer, open the txt file and copy the activation key. 11. Start the guide, click on the unlock tab on the top of the registration window, and paste the activation key in the appropriate text box. Also enter your username - normally it is your email address, but if you bought the guide from a dealer it will be the username that you got from the dealer, not your email address. Then click OK. If you try to activate the cruising guide on a second computer you will see a notification that you have already activated the guide on one computer. You'll see the hardware code of that computer and the activation key that works only on that computer. You will also see a link to a page where you can purchase a second license. Or, log in to your online members account page using the login link in the support menu above where you'll see the same information and link to order a second license. Log in to your members account page using the login link in the support menu above to see your activation information, order a second license, or order a DVD or download of the latest version of the guide. What is the version of my guide and what is the latest version? Open the applications folder in Finder and scroll down to the NEWCAL CRUISING folder and double-click on that to open the folder, then click on the NEWCALCRUISING.app to see the date the file was modified. The latest version is shown on the purchase page. We are constantly cruising in New Caledonia and update the guides often with new images and information. Check on the store page store page for the date of the latest version. Log into your online membership page using the login link on the support menu. You will need your username and password to log in. If you don't know your username or password use the contact form to request access to the membership page where you can update your guide to the latest version by download or new DVD. Be sure to use the email address you used when you purchased the guide or the username given to you if you purchased the guide from an agent. I activated the guide but when I try to run the guide I see a notice LICENCE CODE IS DAMAGED. You missed step 5 in the installation process and have tried to start the guide from within the installation package, not from the applications folder. The installation file is a compressed file to deliver the software. You need to move the software from the delivery package to the applications folder by dragging it's icon into the "applications" shortcut. 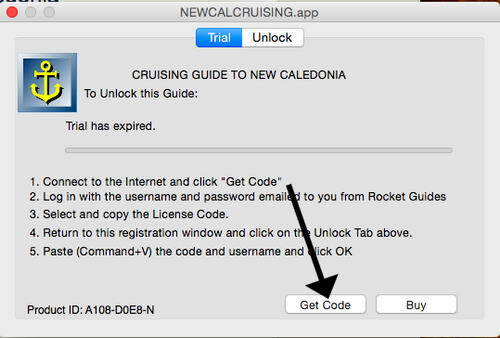 After you have moved the software from the installation package to your Applications Folder and have ejected the installation package use Finder to go to the Applications Folder, scroll down to the NEWCAL CRUISING folder and double-click on that to open the folder, then double click on the NEWCALCRUISING.app to start the program and register the activation code. I activated the guide but when I click on the icon it does not run. 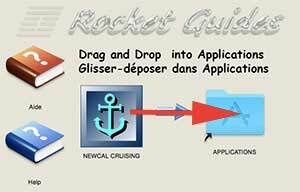 If you activated the guide but when you click on the icon or double click on the app in the Application Folder there is a pause but the guide does not run delete the NEWCAL CRUISING folder from applications, clear the trash, then reinstall the guide from the installation file. That usually works. If it didn't work, see the Installation and Activation section above to review how to get your Mac to allow apps not downloaded from the Apple store and make sure the permissions are correct. Open the Application Folder and the NEWCAL CRUISING folder and Control+Click on NEWCALCRUISING and select "open" from the menu that appears. Then click "open" in the window warning you that this is an app from an unidentified developer. If that does not solve the problem, try this work-around. 1. Move the NEWCAL CRUSING folder from Applications, into Trash and empty the trash. 2. Open the INSTALL-MAC-NEWCALEDONIA-CRUISING.dwg installation file. 3. Drag the Anchor Icon out of the Installation window onto the Desktop, not into applications. 4. Eject the INSTALL-MAC-NEWCALEDONIA-CRUISING.dwg installation file. 5. Double click on the anchor icon on the desktop, then double click on the anchor icon in that folder and the guide should run from there. 6. 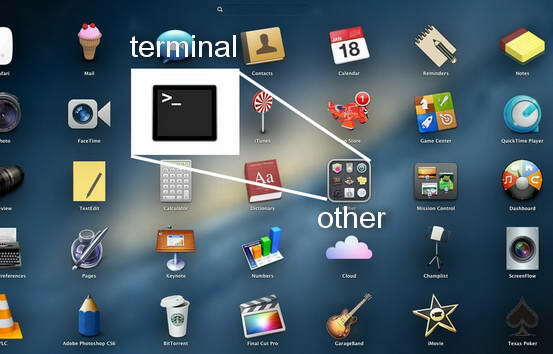 Drag the program icon onto the menu bar to create an icon alias on the menu bar. 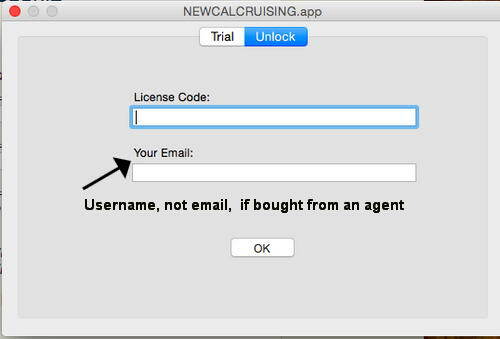 3. exactly what happens, including screen shots of any messages, when you double click on the NEWCALCRUISING app on the desktop. My computer died and I can't uninstall the guide. Use the login link in the menu bar above to log into your online membership page. Scroll down to order a second license. If you do not have the email or a username and password to log in, use the contact form to request access to the online membership page where you can update your guide and order a second license. Be sure to use the email address you used when you purchased the guide or the username given to you if you purchased the guide from an agent. The license is able to detect which computer it is on by detecting hardware and software parameters. If you change your DVD Drive or hard drive or install a new operating system the registration box could appear again. Contact us with an explanation of what you changed on your computer and the hardware number now showing in the registration box. We will be able to determine if it is the same computer and what has changed.